Twenty-three juniors and seniors at Paynesville Area High School were recognized for their scholastic ability and for their leadership, character, and service to the community by their induction to the National Honor Society. Fifteen juniors and eight seniors were inducted into the local chapter of the National Honor Society on Tuesday, March 25, in a ceremony at the middle school media center. Juniors and seniors at PAHS who were inducted into the National Honor Society last week are: (front) Holly Bennett, Amy Roberg, Heather Fuchs, Rachel Hanson, Sami Tierney, and Melissa Andrie; (sitting) Bridgette Johnson, Kayla Welle, Amanda Glenz, Peggy Thompson, Stephanie Herzberg, and Cassie Chrast; (standing) Maureen Flanders, Amber Spanier, Nicole Schlangen, Jessica Virant, Trisha Chevalier, and Angela Wunsch; (back) Riley Flanders, Adam Ingalsbe, Peter Schreifels, Sam Thompson, and Josh Teicher. "I think everyone of you has made a choice to be different, to do something that sets you apart from the rest of the student body," said high school teacher Michelle Andersen during her remarks at the ceremony. "It's pretty humbling to be in front of a room full of talent like this," she added. This year marks the tenth time that the local chapter has inducted students - both juniors and seniors - in the spring, said high school principal John Janotta. 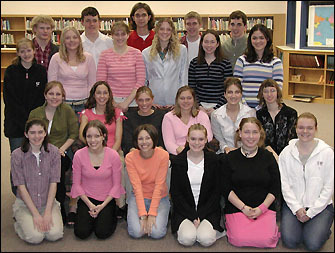 Prior to 1992, the local National Honor Society inductions were done at graduation for seniors only. In 1992, the local chapter revised its guidelines. To be inducted now requires nominations from at least five staff members. Then, after the student submits an application, a five-member faculty council - chosen by last year's crop of inductees - reviews each student and chooses those worthy for induction. Induction in the National Honor Society is a recognition of these students' academic, leadership, character, and service, as well as a call for the students to continue to use these in a positive way, said Janotta. The inductees can take their rightful place in leading the student body, and ultimately in leading society, Janotta added. Inductees from the junior class are: Melissa Andrie, Holly Bennett, Maureen Flanders, Heather Fuchs, Amanda Glenz, Rachel Hanson, Adam Ingalsbe, Bridgette Johnson, Amy Roberg, Peter Schreifels, Peggy Thompson, Sami Tierney, Jessica Virant, Kayla Welle, and Angela Wunsch. Inductees from the senior class are: Trisha Chevalier, Cassie Chrast, Riley Flanders, Stephanie Herzberg, Nicole Schlangen, Amber Spanier, Josh Teicher, and Sam Thompson. Also, these seniors were inducted in 2002 as juniors: Jessica Andrie, Katie Bengtson, Nicole Flint, Amanda Mayer, Mindy Meagher, Justin Reeck, Ann Stalboerger, and Laura Stoneburner.